You ever walk through a small, locally-owned toy shop???!! I have and it is quite the experience -- it is WAY different than walking through the big toy stores that you know exactly what they will have. Local toy shops always offers unique, fun and creative toys for all ages and I love looking through their selections and seeing toys I have never heard or seen before - but ones that are still just as fun, exciting and creative as the bigger toy companies! But, of course, then comes the decision of which awesome toy to buy for my kids and I get so overwhelmed because they are ALL awesome! How do I know which one they will play with for a long time? How do I know which one they will love? How do I know which one others have loved? That's where the awesome Brilliance Awards come in! Someone had the brilliant idea five years ago to cull through 10,000 high quality kids products that overflowed the shelves of the 17 Brilliant Sky Toys & Books stores and pick a few favorites. They dubbed them the Brilliance Awards. This can really help parents decide which games and toys are really fun and stand up above the rest! In all, the 2014 Brilliance Awards covers 10 different brands with price tags from $9.99 to $39.99 with most toys running about $24.99 to $29.99. For the fifth year in a row, parents and grandparents can use this brilliant list as a guide for holiday shopping, birthday presents and Thanksgiving homecoming gifts. What I love about the winners this year is that they are all low tech! In this day and age that is hard to find but I definitely love low tech toys for my children so this really impresses and excites me! Designed in Britain and winner of 10 toy awards, Lottie is a new, innovative fashion doll who stands for positive contemporary values. Her bright, vibrant clothes, silky hair, and creative accessories are tailored to reflect a young girl who is happy, brave, imaginative, and bright - the most positive role model possible. And she stands on her own two feet -- figuratively and literally. At 7", she's the easiest size for girls ages 3 - 9 to clasp, and thanks to bendable joints, she can stand and assume different poses. My daughter is going to absolutely LOVE this doll for Christmas! She is the perfect size for her little toddler hands and she is going to love dressing her, snuggling her and playing with her! Imagine holding a real book, written and illustrated by your own child. Kids' minds are alive with imagination. Their stories are so unique and amusing. They love to draw, create and write. Just think how they'll respond when you tell them to write a story and it'll actually become a book -- bound and printed. This kit includes everything -- it only lacks a child's fantastic creativity. Blank sheets, with a border frame to draw in and lines to write on, are waiting to be filled. (The finished book will hold 12 pages, but 18 template sheets are given in case an elbow gets bumped or the storyline changes.) Create a separate sheet for every page; draw a picture on the cover sheet. Fill in the info sheet with the child's name, book title, and dedication. Place all the completed pages into the postage paid envelope and drop in the mail! Creatively Ever After will ship back the final product in 4 to 6 weeks. This is a great gift idea for any creative child! I LOVE that they really make it into a real book that can be cherished for many, many years! What a great keepsake! Create a realistic ball park where you get to strike out your opponent with fast balls and curve balls. Throw a variety of breaking balls at different speeds. Your opponent won’t be able to predict the pitch you will throw! A unique magnetized infield creates ball movement when the pitches are thrown. There is a spring-loaded bat, counter for balls, strikes and outs. Hit singles, doubles, triples, foul balls and home runs! Choose to bat right or left-handed. Strategically position fielders. The only thing missing are the Cracker Jacks! This is a great gift idea for the athletic child in your life! They will love creating baseball game after baseball game! Congratulations to ALL of the 2014 Brilliance Award winners! See the entire list below from youngest (3 years+) to oldest (8+) recommended ages. So, this holiday season (and any season!) consider shopping at your local Brilliant Sky Toys & Books! It is truly the place where everyone can find their way to play. Visit them at www.brilliantskytoys.com. You can purchase all these toys at 17 specialty stores across the country from Tennessee and Iowa to Texas and North Carolina and at their website, www.BrilliantSkyToys.com. 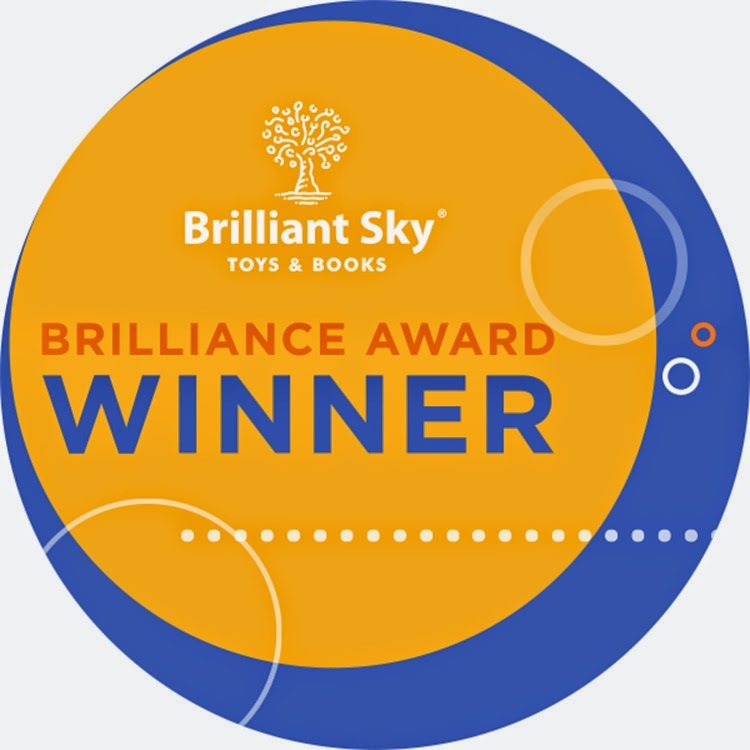 Brilliance Sky Toys & Books is generously offering (1) Toy from Brilliance Award Winners to a lucky winner!